The Cavalier King Charles Spaniel has always been kept solely as a companion. 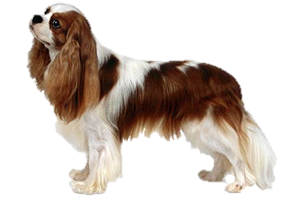 They have four different coat varieties, the Blenheim, tricolor, black and tan and Ruby. The Blenheim is white with red or chestnut markings, while the Ruby is a red. The Black and Tan is black with rich bright tan markings, and the tricolor is white, black and tan. The history of the Cavalier King Charles Spaniel coincides with that of the English Toy Spaniel until the 1920s. While most fanciers were selectively breeding for dogs with short muzzles there were some that still like the long pointed muzzle of the original dogs. However, these dogs were becoming so rare that they were hard to find. In 1926 an American by the name of Roswell Eldridge offered twenty-five pounds prize money to any person showing dogs with long noses at Crufts. He offered this prize for five years and eventually enough dogs were found to create a breeding stock. His selective breeding not only lengthened the muzzle, but also created a larger breed overall. By the 1940s the two were considered to be separate breeds.